The Master of Arts in Culture and Environment in Africa (CEA) is a two-year English-medium, interdisciplinary degree programme, focusing on the archaeological, historical and contemporary political ecology of the African continent. Particular attention is given to skills, methods and knowledge of human-environment studies in Africa. The degree will provide students from diverse disciplinary backgrounds with a comprehensive understanding of the complex interrelationships between human agency, socio-cultural dynamics and geobiophysical processes. CEA combines natural science, archaeological, historical, anthropological and linguistic research approaches, offering graduates enhanced career prospects not only in academia, but also in national and international organizations operating in the field. 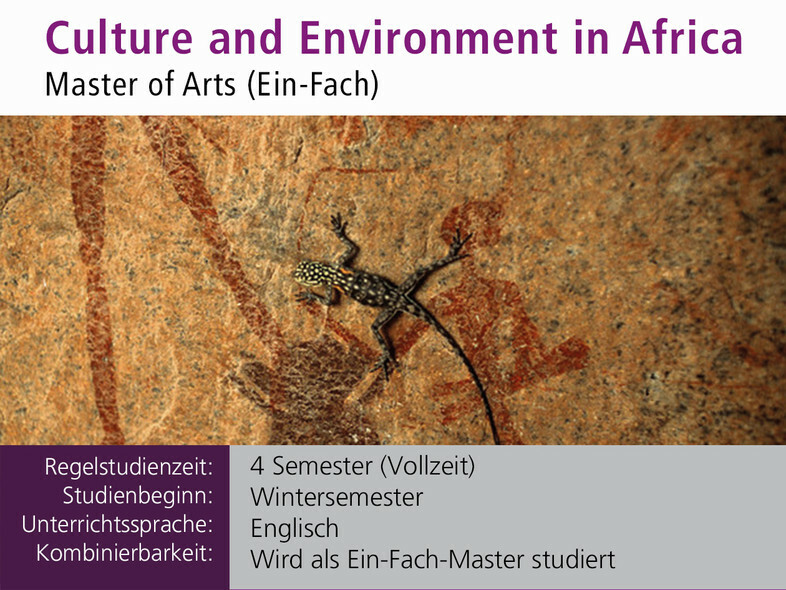 Applicants who hold a Bachelor's degree or its equivalent in Archaeology, Social Anthropology, African Studies, Geography, Sociology, Development Sociology, Political Sciences, or other relevant disciplines are well suited for the Culture and Environment in Africa MA programme. Non-native English speakers must provide proof of proficiency at the C1 level in the Common European Framework system. Due to visa matters, it is highly recommended that applicants with passports from non-European countries apply by January 15, as the visa application process can take several months. 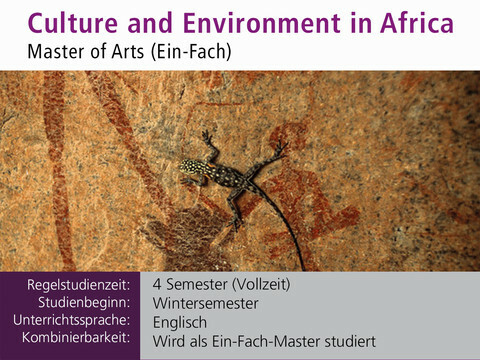 A limited number of scholarships are available for students from African countries. The MA programme consists of six specialization modules and one complementary module. 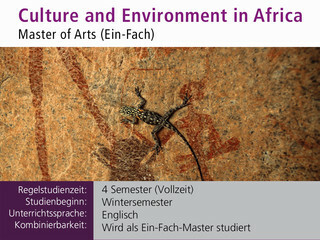 In Module 1 students obtain a common understanding of the field of human-environment relations. Module 2 provides a sound training in interdisciplinary methodology and research approaches. Modules 3, 4 and 5 introduce students to the core themes of contemporary human-environment research. In Module 6 students prepare and conduct research and present the results. The complementary module includes courses on specific topics of human-environment relations (historical ecology, land-use systems, museum anthropology and international environmental law). The MA programme has a vast network of partners around the world, which provide CEA students with international research and study opportunities.